Manic Street Preachers head a mighty Welsh Triple Crown this month, playing their biggest ever headline date at Cardiff CIA, with support from the Super Furry Animals and Catatonia. Jon Parry salutes the boys from Blackwood! From enjoying a love-hate relationship with the weekly music press to winners of the best album category in this years `Q' awards. the Manic Street Preachers have, hike a particularly turbulent punk rock tumble drier. come full circle. They once wore spray-painted school shirts ("to wipe-out the brainwash and the boredom"). but now come on all sporty and collegiate displaying a more sober outlook. no doubt in the wake of Richey Edwards' disappearance early last year. Blackwood's favourite sons can look back on early days of playing to a handful of disinterested punters in Cardiff's now defunct Square Club to headlining a 6,000 sell out at the CIA and afford a winsome smile. If only Richey were here to share the glory! Bluster and outrageous were the band's initial forte: "when we jump on stage it's not a rock'n'roll cliche but the geometry of contempt." Aah, that explains bass player Nicky Wire's distinctive scissor kick style then! This is the band who once spat out: "We are the suicide of the non-generation. We are as far away from anything in the '80s as possible -'80s post automation, the long running saga of the whimsical pop essay and the intrinsic musical sculptures of post-modernism." Yeah right, but let's sneak back to the early eighties and Blackwood...Blackwood calling to the faraway towns. A quick Manic's history reveals that the original foursome were bonded from an early age. James and the loveable hypochondriac Nicky Wire were solid classmates from the age of five. Richey lived on the same street as Wire. Drummer Sean Moore is Bradfield's cousin and, when he was 10, went to live with his family. Moore and James B were in the same form at secondary school. They lived in a long, terraced street; and by James and Richie's admission had a magical childhood, playing on a big disused slag heap with trees growing on it. James: "Everything happened there - bonfire night. Halloween. a lot of people lost their vir-ginity there. If there was a fight between Pontllanfraith and Springfield. it happened on this slag heap. It's gone now. levelled. When I go back. what strikes me is there's less places for people to hide. Hide and just be innocent. Lose their innocence too." As childhood melted into adolescence. the backdrop to their lives changed and the four-some became 'bedroom boys'. plotting and planning a way out of their anonymous situation. Nick: "A big moment was on the tenth anniversary of punk. The Clash were on a compilation of that Tony Wilson programme `So It Goes'. doing 'Garageland' and 'What's My Name'. That was the catalyst to us forming a band We thought we could look like that, walk like that. Although we couldn't play." The band also consumed huge chunks of youth culture via the weekly NME, and had their imagination further fired up by various outsider art (Pollock. Hopper) and iconic movie dissenters (Betty Blue, One Flew Over The Cuckoo's Nest). 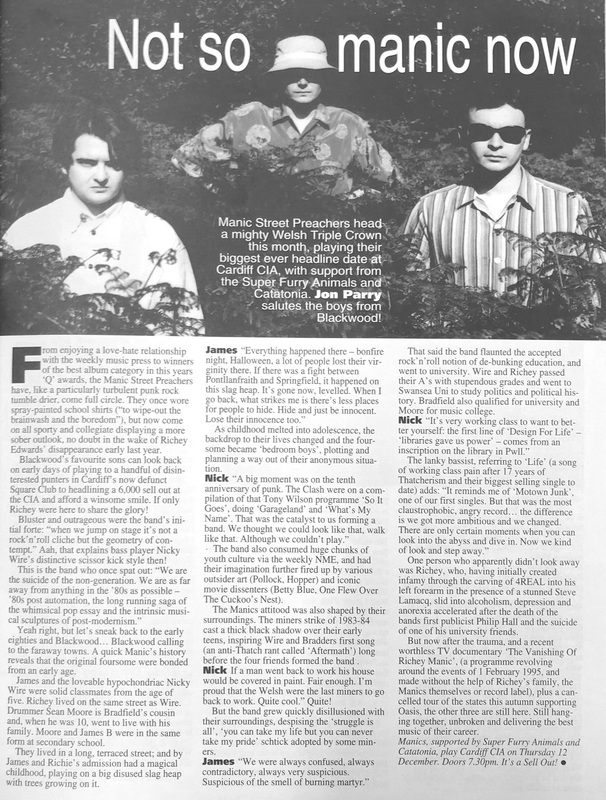 The Manics attitood was also shaped by their surroundings The miners strike of 1983-84 cast a thick black shadow over their early teens, inspiring Wire and Bradders first song (an anti-Thatch rant called 'Aftermath') long before the four friends formed the band. Nick: If a man went back to work his house would be covered in paint. Fair enough. I'm proud that the Welsh were the last miners to go back to work. Quite cool." Quite! But the band grew quickly disillusioned with their surroundings, despising the 'struggle is all', 'you can take my life but you can never take my pride' schtick adopted by some miners. James: "We were always confused, always contradictory, always very suspicious. Suspicious of the smell of burning martyr." That said the band flaunted the accepted rock'n'roll notion of de-bunking education, and went to university. Wire and Richey passed their A's with stupendous grades and went to Swansea Uni to study politics and political history. Bradfield also qualified for university and Moore for music college. Nick: "It's very working class to want to better yourself: the first line of 'Design For Life' - 'libraries gave us power' - comes from an inscription on the library in Pwll." The lanky bassist, referring to 'Life' (a song of working class pain after 17 years of Thatcherism and their biggest selling single to date) adds: "It reminds me of 'Motown Junk', one of our first singles. But that was the most claustrophobic, angry record...the difference is we got more ambitious and we changed. There are only certain moments when you can look into the abyss and dive in. Now we kind of look and step away." One person who apparently didn't look away was Richey, who, having initially created infamy through the carving of 4REAL into his left forearm in the presence of a stunned Steve Lamacq, slid into alcoholism, depression and anorexia accelerated after the death of the bands first publicist Philip Hall and the suicide of one of his university friends. But now after the trauma, and a recent worthless TV documentary 'The Vanishing Of Richey Manic', (a programme revolving around the events of 1 February 1995, and made without the help of Richey's family, the Manics themselves or record label), plus a can-celled tour of the states this autumn supporting Oasis, the other three are still here. Still hang-ing together, unbroken and delivering the best music of their career.